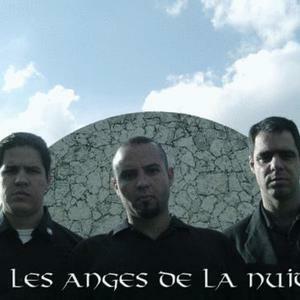 Les anges de la nuit is the trinity that blends mystic, dark electronic and bombastic pop music. Hailing from Miami / Ft Lauderdale , "les Anges de la Nuit" was formed in 2003 by three members and friends Milton Sanchez, Richard Abdeni and Anthony Stuart. The name and concept of "les Anges de la Nuit" defines a correlation between biblical prophecies and our present world. Their unique, energetic and poignant sound lies in the multi-cultural influence of their roots. Hailing from Miami / Ft Lauderdale , "les Anges de la Nuit" was formed in 2003 by three members and friends Milton Sanchez, Richard Abdeni and Anthony Stuart. The name and concept of "les Anges de la Nuit" defines a correlation between biblical prophecies and our present world. Their unique, energetic and poignant sound lies in the multi-cultural influence of their roots. Their first album ?Ruins of Victory? was released on 02-14-2005 on Infacted Recordings. ?Under God's Name? is the title of their second studio album with a total of 15 songs and 70 minutes of pure club power and was released by Infacted Recordings on Dec 8th , 2006.